Having reformed in 2013, it hasn't taken Capital Letters long to get back into their stride and 2015 sees them embarking on a series of European live dates reminiscent of their heyday in the late seventies and early eighties when they were the unofficial UK reggae ambassadors to Europe, constantly touring throughout the Continent. To coincide with the start of these dates, Sugar Shack Records will be releasing the first all new Capital Letters album in thirty years. The band have spent much of the summer in the studio of Noel Browne, Noel only recently relocated to the UK and built his new studio. He's a former Studio One Band, Taxi Gang and Maytals keyboard player who is perhaps better known as the man behind New Name Music, the studio he set up in 1987 where he was to achieve success with Luciano, Mikey Spice and Jack Radics amongst many, before building Big Ship Recording Studios in 1995 where he worked with Freddie McGregor, The Wailing Souls, Papa San and numerous others. Utilising Noel Browne's engineering skills, the band recorded 14 songs which were then passed into the safe hands of regular Sugar Shack collaborator Dave 'Oldwah' Sandford for final mixing. The album kicks off with a trio of classic roots tracks, “Jah Music”, a highlight of their live shows, “Wolf” as recently released in a remix form on a Sugar Shack 12” and “Roots Music”. Just when you think the pattern is set, the band turn things around and with a novel approach they continue with a mainly roots themed set, but in a case of an iron fist inside a velvet glove, hard hitting roots messages are underpinned by often upbeat backing. The songs; “Place On Earth”, “Dat Nah Stop”, “False Natty”, “Tell Me What's Wrong” and “Opportunity” all contain strong messages that may be missed on casual listening with their deceptive, almost too upbeat backing tracks, an unusual approach that shows just how confident and skilled the band are. It's not all politics and preaching. One of the songs is a heartfelt tribute to the band's home town, Wolverhampton in the British Midlands. 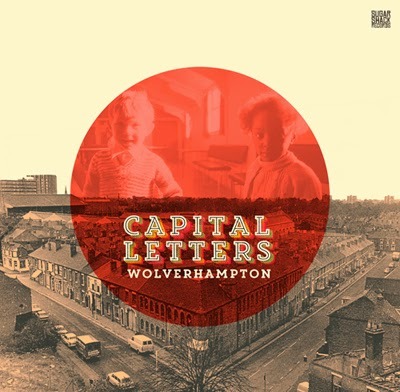 It was obvious that with Capital Letters strong ties to the City, this was the perfect track to name the album after and so “Wolverhampton” is the album title and will no doubt have more than a few of the band's overseas fans checking their atlases. A perfect companion piece to “Wolverhampton” is the track “Jamaica” which paints a charming child's eye picture of the huge changes and culture shock encountered by the children who arrived in Britain to join the windrush generation during the fifties and sixties. Co vocalist Lukas doesn't forget his past as a Lovers Rock artist and we are treated to a solitary love song with “Movie Star”. Lukas puts in such a consummate performance, it makes one hope the band will record more material along similar lines in future.